Sunshine and boats and history and school…. and July begins…. The last week of class also included a field trip to the Pantheon, via my favourite garden. I walked past the Pantheon every day on my way to school, yet had never been inside. Right now the dome is under renovations, so it is covered by a gargantuan white plastic wrap and images of hundreds of people looking out as if they are watching a spectacular show. They hired a street artist named J R who is known for giant street-art portraits, to add some modern art to the Pantheon while the renovations are taking place, so in addition to the exterior 360 degree audience art on the dome, inside the entire main floor is covered with the same style of photographs. People were asked to submit/upload a photo of themselves and J R created this composition of over 4000 faces. A model of the Pantheon. We also went down to the crypt below, where most of the people buried there have their tombs. To note in particular, there was Voltaire, Marie Curie, and Victor Hugo, to name a few. My class waiting for me. I still maintain I was not lost, just exploring. Our class time ended before we finished our field trip, so it was only me, a couple of my classmates, and our teacher Isabelle, who continued to the University Sorbonne. They don’t normally let tourists through and have security guards at all entrances, but Isabelle sweet-talked a couple guards to let the four of us walk though, (or maybe it was easier because classes and exams were done for the year… Or we just looked adorably innocent). And of course we immediately snuck into a couple of the ancient classrooms and took photos of ourselves being silly. Isabelle ran down to the front to ‘teach’ us something. 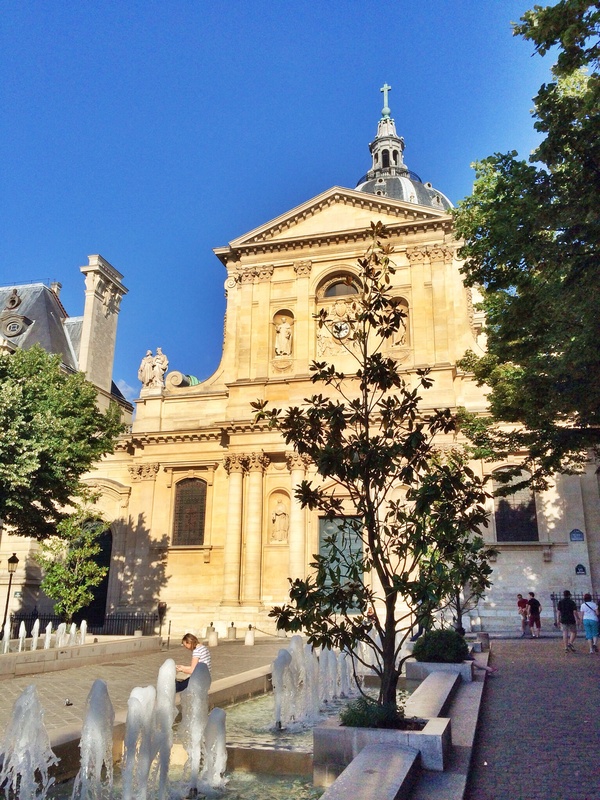 The University Sorbonne is one of the oldest universities in the world, and the courses here range from Literature, Languages (like Greek and Latin), to Social Sciences and History. Most of the traditional classrooms have frescos painted on the walls, chalkboards, ornate ceilings, and sculptures and art around the room. (And in one instance, a grand piano, of course.) It felt like we were on a movie set or something. Every inch of this architecture was stunning. More stories and photos to come soon, of course, but with company! ← A dessert that could feed a small country and a rant about chocolate.